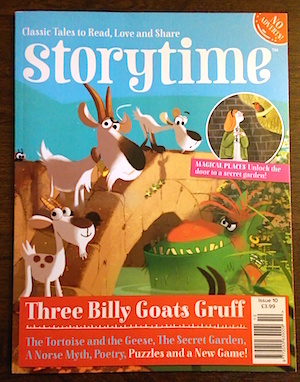 Storytime magazine publishers have generously agreed to provide a lucky winner with a 12 month subscription for their school! Storytime is a vibrant, colourful and exciting magazine, encouraging children to fall in love with books. Each edition includes lots of short stories, puzzles and games. What is your favourite children’s story and why? To enter this competition, please leave a reply below with your answer. That’s it! The closing date for all entrants is 7th August 2015. We will notify the winner by email after the closing date, who will receive a 12 month subscription to Storytime magazine for his/her school. The competition is open to UK residents only and the winner will need to provide a UK school address. My favourite children’s story is Red Riding Hood. This is because it has so many layer and so may versions, that it can appeal to everyone no matter what age. I particularly like the Chinese version, where Red Riding Hood is called Goldflower and she defeats not a wolf but a bear! The Twits – Roald Dahl. Still makes me chuckle! My favourite story is fantastic Mr fox. It was the first story I read by myself as a child and I read it hundreds of times. I loved the descriptions of the three farmers. My favorite story for telling is Harry the Dirty Dog by Gene Zion. I enjoy telling stories that keep both the children and adults listening. The twist at the end is wonderful! Stig of the dump is amazing … have always read it go my classes over past 8 years x it always amazes them how the characters manage to understand each other…. My favourite childrens book is Winnie the Pooh. Lovely, funny, eccentric. I read to my children and now they love it too!